Show your support and cast your vote for TalentExchange! Sourcing today is extremely inefficient. In-house recruiters need to leverage a multitude of online and offline sourcing channels to identify the best talent for open positions. Unfortunately most channels are costly and inefficient such as online job boards and external recruiters. Job boards are still the foundation of most corporate sourcing strategies but provide uncertain return-on-investment due to their complex licensing structures. Community sourcing however is an exciting new way for employers to source talent. Built on the premise that one company's less-than-ideal candidates may be ideal for another company, Talent Exchange brings community sourcing to Taleo’s community of customer companies in order to collectively enhance the overall candidate pool by sharing candidates so each and every company benefits from the right talent for the right position. Talent Exchange provides Taleo customers with an exact return on investment by using a transaction model (you pay for what you source) unlike other sourcing options that usually rely on a license or monthly subscription fee. Talent Exchange provides recruiters with a one stop shop for their external sourcing needs by presenting high quality Universal Profile candidates as well as aggregating other candidate source data from across the web. Talent Exchange is a crowd-sourced talent marketplace fueled by Taleo’s 4,500 customer companies who invite alumni or candidates who are not a good fit to join Talent Exchange thereby earning credits to download new job seekers from the expanding Talent Exchange candidate pool. When invited, job seekers visit www.talentexchange.com to create a Universal Profile that can be automatically imported by interested recruiters into Taleo’s recruiting application. This unique crowd-sourced model along with free job postings provides Taleo’s customer companies with a no-cost / low-cost talent sourcing option. 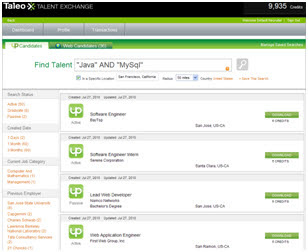 For job seekers, Talent Exchange provides exposure to high-quality, name-brand employers within the Talent Exchange community, free searching across millions of jobs, and a Universal Profile to quickly apply on Taleo-powered career sites. Show your support and cast your vote for Talent Exchange!